From our award-winning annual Community Guide & Business Directory to our quarterly Hewitt Express magazine, there are plenty of opportunities throughout the year to highlight your business in the greater Hewitt/Woodway market. Our guide is a 74-page, full-color, professional publication designed to attract and educate visitors, residents and businesses in the Central Texas area. 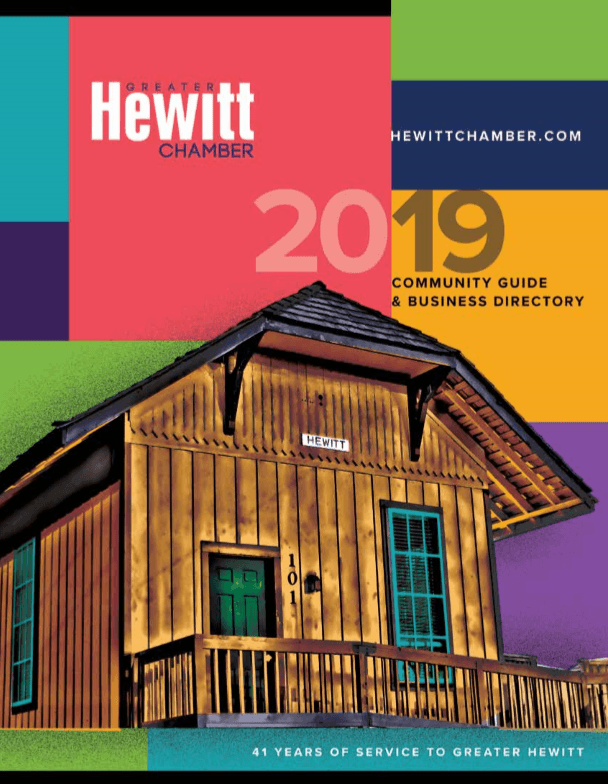 The Chamber prints 3,000 guides every January – mailed directly to Chamber members and distributed to area visitor centers in neighboring counties and along the I-35 corridor, to high-traffic businesses in Hewitt and Woodway, and to new residents throughout the year. Hewitt is known for its high quality of life, safe neighborhoods, excellent schools, pristine parks and proximity to many local attractions, state-of-the-art healthcare facilities and unique shopping/dining opportunities. The Greater Hewitt Chamber and City of Hewitt are proud to serve its residents and welcome visitors to our community. Ads must be sent as CMYK high-resolution PDF, JPG or PNG format with fonts converted to outline. Ad files generated from Microsoft Word, Microsoft Publisher or similar programs will not be accepted, and are unsuitable for commercial printing. Need help to design a new ad? 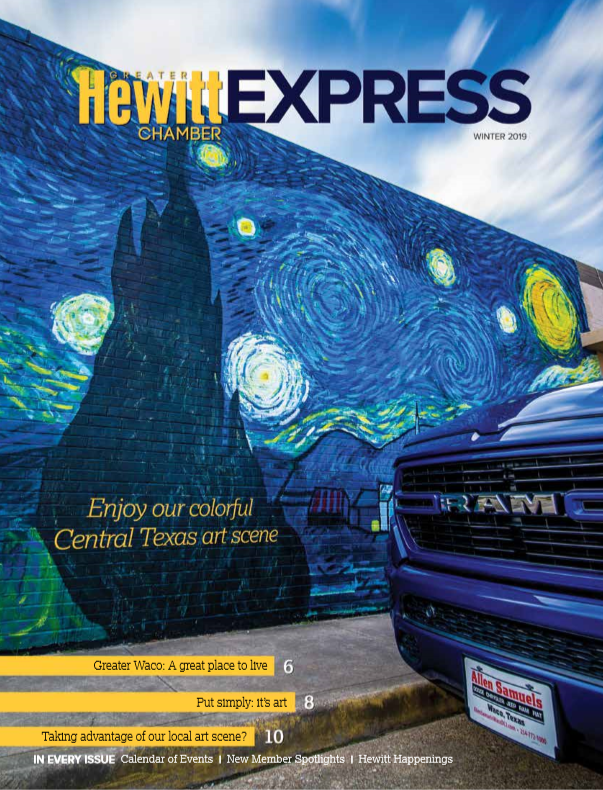 Each quarter (January, April, July and October), 3,000 copies of the Hewitt Express magazine are printed, with over 500 mailed directly to Chamber members, and the remainder placed in 40+ high-traffic locations in the greater Hewitt area (banks, Post Office, clinics, restaurants and Walmart). The magazine is also distributed digitally through the Chamber & Midway ISD. We’re proud to include local business-owners, community leaders, Hewitt residents and those living and working in the greater Hewitt area in our readership. This includes both men and women, typically in the 21-54 age range, well-educated with a fair amount of disposable income. Readers are active in the community and are committed to making Hewitt a better place to live, work and play. SUMMER ISSUE: Our History & Future | Space reservation deadline: May 15, 2019 | Art deadline: May 31, 2019 | Distributed July – Sept.
FALL ISSUE: Better You Issue—Skills for Success | Space reservation deadline: Aug. 15, 2019 | Art deadline: Aug. 30, 2019 | Distributed Oct. – Dec. Pick up your directory and Express copies at these locations!